Space shuttle Discovery lifts off into the night sky on a mission to the International Space Station. Launch was on-time at 11:59 p.m. EDT. Credit: NASA TV. 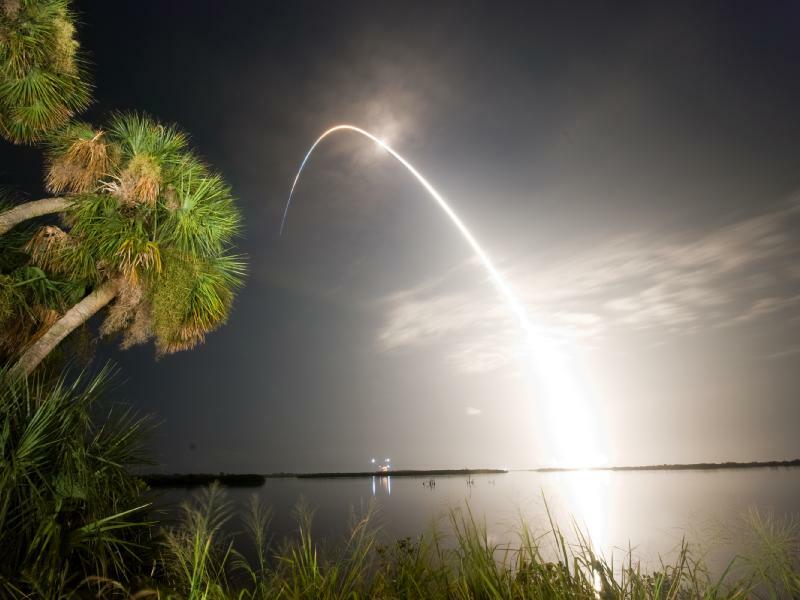 The space shuttle Discovery soars into the night sky above the Kennedy Space Center in Florida on Aug. 28, 2009 at 11:59 pm ET to begin a 13-day mission to the International Space Station. Credit: Robert Pearlman/collectSPACE.com. Viewed from the Banana River Viewing Site at NASA's Kennedy Space Center in Florida, space shuttle Discovery arcs through a cloud-brushed sky, lighted by the trail of fire after launch on the STS-128 mission. Liftoff from Launch Pad 39A was on time at 11:59 p.m. EDT. The first launch attempt on Aug. 24 was postponed due to unfavorable weather conditions. The second attempt on Aug. 25 also was postponed due to an issue with a valve in space shuttle Discovery's main propulsion system. The STS-128 mission is the 30th International Space Station assembly flight and the 128th space shuttle flight. The 13-day mission will deliver more than 7 tons of supplies, science racks and equipment, as well as additional environmental hardware to sustain six crew members on the International Space Station. The equipment includes a freezer to store research samples, a new sleeping compartment and the COLBERT treadmill. Credit: NASA/Ben Cooper. NASA's newest astronaut treadmill, named COLBERT after comedian Stephen Colbert, will launch aboard the space shuttle Discovery's STS-128 mission on Aug. 25, 2009. Credit: NASA. That's a great photo of the launch. I said it before and i'll say it again, I never get tired of looking at shuttle launches, its a thing of beauty. For those that missed the lauch, clicky below. The space shuttle Discovery hurtles toward space on the STS-128 mission on Aug. 28, 2009. Below the main engine nozzles are the blue mach diamonds, a formation of shock waves in the exhaust plume of an aerospace propulsion system. Credit: NASA/Tony Gray-Tom Ferrer. 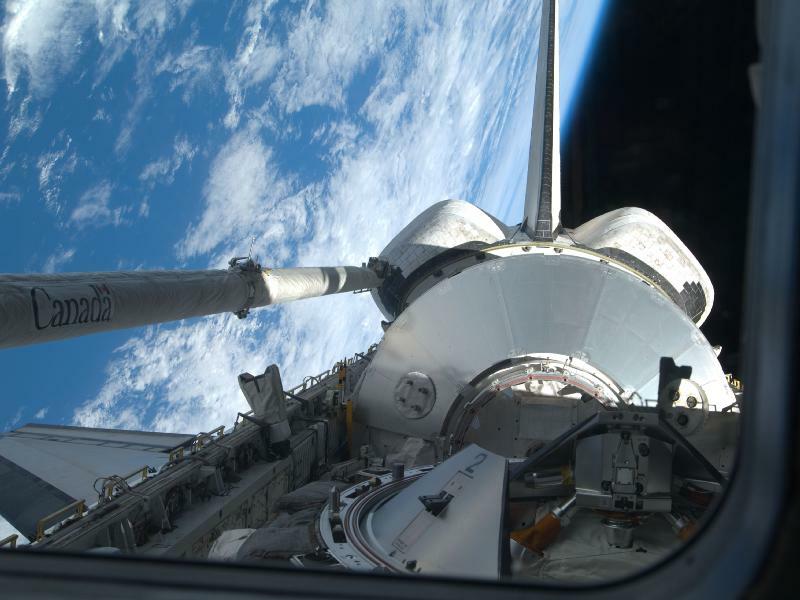 During their first full day in space, astronauts aboard Discovery conducted a daylong inspection of the space shuttle’s thermal protection system, checked out spacesuits and prepared to dock with the International Space Station. With Commander Rick Sturckow at the controls, Discovery is scheduled to link up with the space station at 8:03 p.m. CDT Sunday. Pilot Kevin Ford and mission specialists Patrick Forrester and Jose Hernandez took turns using the 50-foot-long Orbiter Boom Sensor System, attached to the shuttle’s robotic arm, to inspect the shuttle’s right wing, nose cap and left wing. Mission specialists Danny Olivas, Christer Fuglesang and Nicole Stott completed a two-hour checkout of the spacesuits that will be used during three spacewalks planned for the docked phase of the mission. Docking preparations occupied the remainder of the crew’s workday. The crew tested equipment that will be used for rendezvous operations. 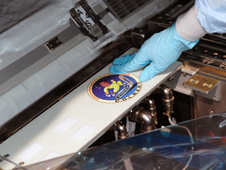 The C.O.L.B.E.R.T decal is placed on the Combined Operational Load Bearing External Resistance Treadmill. Credit: NASA/Jim Grossmann. Space shuttle Discovery as seen from the International Space Station prior to performing the rendezvous pitch maneuver or "back flip" just ahead of docking on Aug. 30, 2009, during the STS-128 mission. Credit: NASA TV. This view from a camera aboard the shuttle Discovery shows the International Space Station just before the two spacecraft docked on Aug. 30, 2009 high above the Atlantic Ocean. Credit: NASA TV. 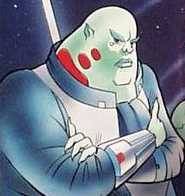 Hi, I'm Buzz. 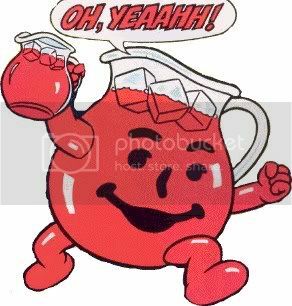 Have a moon rock! It's funny how the picture on both the moon rock articles is different. It looks like BBC got a picture of the real fake rock. It totally looks like petaifed wood to me. The Onion is always great for a laugh. Japan's first unmanned spacecraft to haul cargo to the International Space Station (ISS) is nearly ready for its maiden launch next week. The new cargo ship is poised to launch toward the station on Sept. 10 at 1:01 p.m. EDT (1701 GMT) from the Tanegashima Space Center in southern Japan on a shakedown cruise. If all goes well, the inaugural spacecraft, called the H-2 Transfer Vehicle 1 (HTV-1), should arrive at the station on Sept. 17. The spacecraft was built by JAXA, Japan's space agency, and will launch atop the country's brand new H-2B rocket. It will be early Sept. 11 Local Time at the Japanese launch site at the time of liftoff. "JAXA is ready to carry out the important HTV-1 mission as a new contribution to the ISS program," said Masazumi Miyake, director of the JAXA office at NASA's Johnson Space Center in Houston, in a Wednesday briefing. JAXA mission managers are expected to hold a series of final readiness reviews for HTV-1 and its rocket booster to make sure it's ready for launch day. "There's very little work to be done," said Mike Suffredini, NASA's space station program manager. "We're all on schedule and we're not working any issues relative to this launch." Suffredini said that the new spacecraft, like cargo ships built by Europe and Russia, will be vital to support the space station's six-person crew once NASA's space shuttle fleet retires in the next year or so. The HTV-1 cargo ship is Japan's latest contribution to the International Space Station. Astronauts completed construction of JAXA's enormous Kibo laboratory, a $1 billion facility the size of a tour bus, in July with the addition of an exterior experiment porch. The spacecraft is a solar-powered cylinder about 33 feet (10 meters) long and 14 feet (4.4 meters) wide. It can haul up to 6 tons of pressurized and unpressurized cargo to the station, but will only be packed with about 3 1/2 tons for its debut flight. Unlike the automated cargo ships built by Russia and Europe, which can dock themselves at the station, the HTV-1 is designed to fly close to the orbiting laboratory and be grabbed by its robotic arm. Astronauts inside the outpost will oversee the approach, rendezvous and grapple. After about a month at the space station, the disposable cargo ship is expected to be detached from the outpost and commanded to intentionally burn up in the Earth's atmosphere over the southern Pacific Ocean. Miyake said JAXA has spent about $680 million since 1997 to develop the HTV spacecraft. The vehicle alone costs about $220 million, he said. The new H-2B rocket launching the HTV-1 cargo ship is a more powerful booster derived from Japan's workhorse H-2A rocket, which the country has been flying since 2001. The HTV spacecraft will be controlled from JAXA's Tsukuba Space Center, which is also home to the agency's Kibo mission control center. Japan has until Sept. 30 to try and loft the HTV-1 mission from its seaside launch site before its window closes due to the country's off-shore fishing season. The next opportunity to launch the spacecraft after September is in February 2010, Suffredini said. Credit: Tariq Malik Managing Editor Space.com. JAXA's debut H-2B rocket stands poised atop its launch pad at the Tanegashima Space Center in southern Japan, where it awaits the delivery of its payload - the first HTV cargo ship. Credit: JAXA. This diagram released by NASA and JAXA depicts Japan's new H-2 Transfer Vehicle, a 10-meter long unmanned space freighter to deliver internal and external cargo to the ISS. Credit: NASA/JAXA. An artist's interpretation of Japan's H-2 Transfer Vehicle arriving at the International Space Station. Credit: JAXA. Backdropped by Earth's horizon and the blackness of space, the Leonardo Multi-Purpose Logistics Module is visible in Discovery's payload bay, as is the shuttle's vertical stabilizer, orbital maneuvering system pods, Orbiter Boom Sensor System and docking mechanism in this image shot from an aft flight deck window. For the STS-128 mission, Leonardo carried 7.5 tons of supplies to the station, including two research racks (the Fluid Integrated Rack and the Materials Science Research Rack), a new station crew quarters, the Minus Eighty-Degree Laboratory Freezer for ISS (MELFI-2), the Air Revitalization System Rack and the COLBERT treadmill. Credit: NASA. Expedition 20 flight engineer Nicole Stott participates in the STS-128 mission's first spacewalk as construction and maintenance continue on the International Space Station. 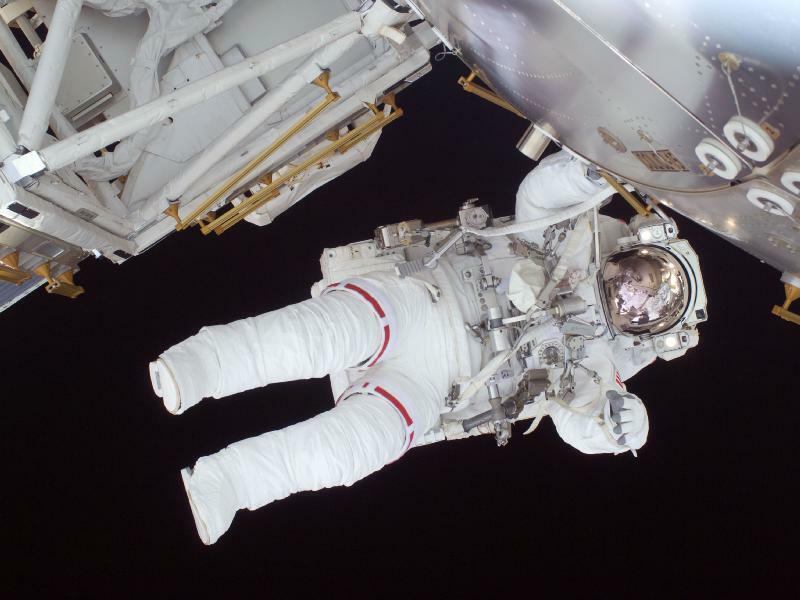 During the six-hour, 35-minute spacewalk, Stott and astronaut Danny Olivas (out of frame) removed an empty ammonia tank from the station's truss and temporarily stowed it on the station's robotic arm. Olivas and Stott also retrieved the European Technology Exposure Facility and Materials International Space Station Experiment from the Columbus laboratory module and installed them on Discovery's payload bay for return. Credit: NASA. 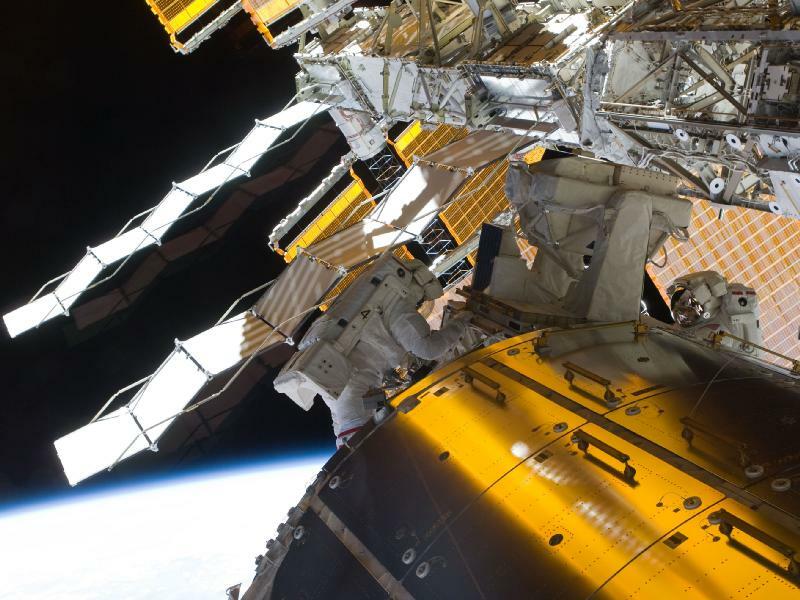 As part the STS-128 mission's first spacewalk, astronauts Danny Olivas and Nicole Stott (right) removed an empty ammonia tank from the station's truss and temporarily stowed it on the station's robotic arm. Olivas and Stott also retrieved the European Technology Exposure Facility (EuTEF) and Materials International Space Station Experiment (MISSE) from the Columbus laboratory module and installed them on Discovery’s payload bay for return. Credit: NASA. 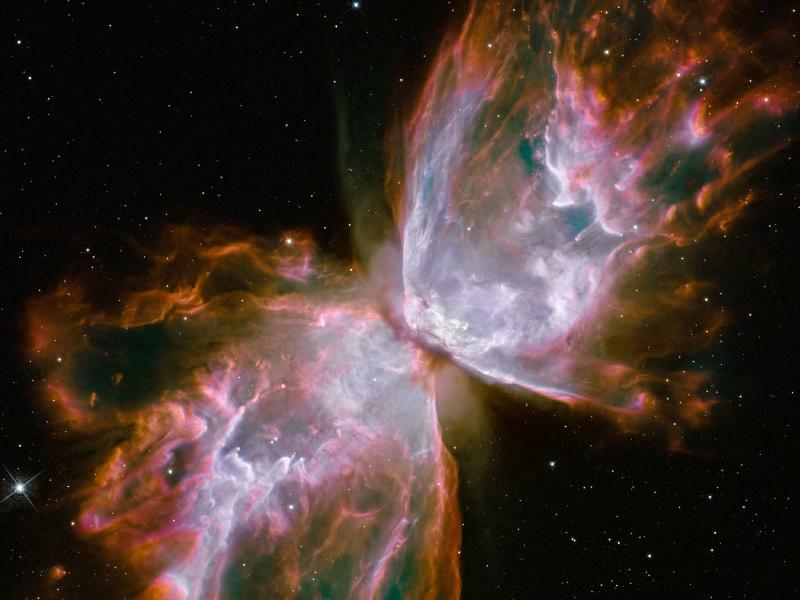 NGC 6302: Butterfly Emerges from Stellar Demise in Planetary Nebula NGC 6302. 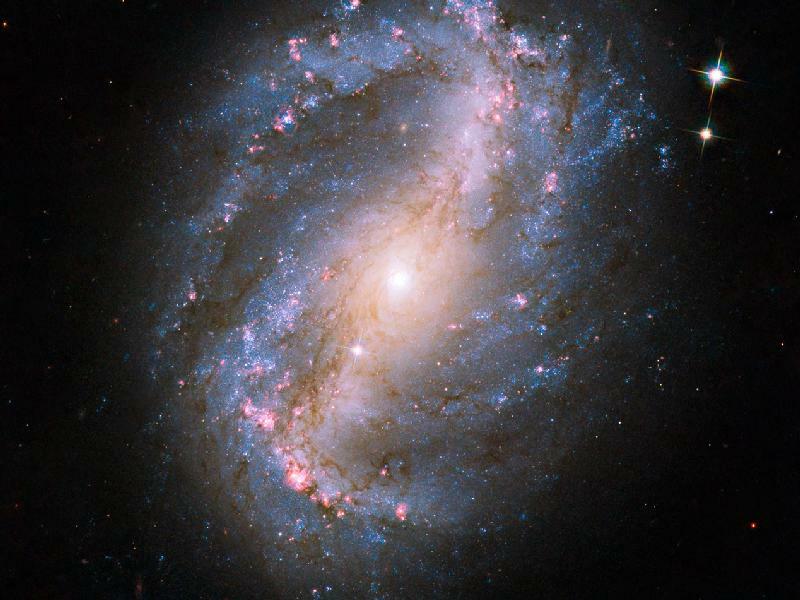 NGC 6217: Barred Spiral Galaxy NGC 6217. Japan's first space cargo ship soared into orbit Thursday to begin its maiden cruise to the International Space Station. The Japanese H-2 Transfer Vehicle lifts off from the Tanegashima Space Center in Japan on Sept. 10, 2009 EDT (Sept. 11, 2009 Local Time) on its maiden flight to the International Space Station. Credit: NASA TV/JAXA. The astronauts on space shuttle Discovery are ready to wrap up a nearly 13-day flight with a landing this evening at the Kennedy Space Center in Florida. 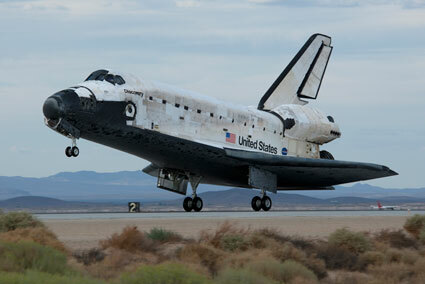 Space shuttle Discovery performed an orbital adjustment burn at 12:02 p.m. EDT to avoid an unidentified piece of debris. Although unclear, the object is believed to be from the mission's third spacewalk. The deorbit burn for today’s first landing opportunity today, on orbit 202, is at 5:59 p.m. 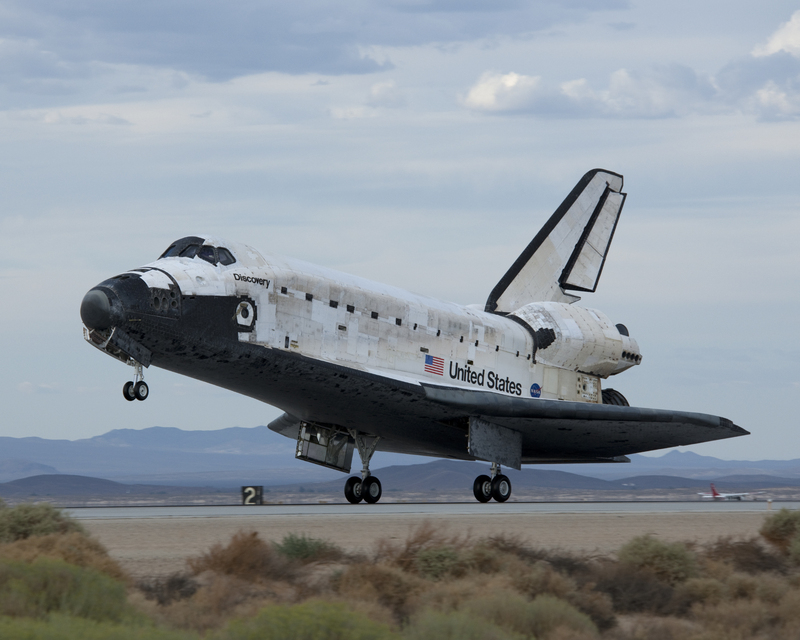 Discovery would cross above southern Mexico and the Gulf of Mexico, skirt west of Cuba and cross the Florida coast above Sarasota, with landing at Kennedy’s runway 15 at 7:05 p.m. A second landing opportunity at Kennedy today would put the shuttle and crew on the ground at 8:42 p.m. The weather forecast for both opportunities today calls for a chance of thunderstorms within 30 nautical miles of the Shuttle Landing Facility. The space shuttle Discovery is backlit by the limb of a bright blue Earth and the blackness of space in this view from a camera on the International Space Station after undocking on Sept. 8, 2009 during the STS-128 mission. Credit: NASA TV. The International Space Station is seen from space shuttle Discovery as the two spacecraft begin their relative separation on Sept. 8, 2009 after nine days of docked time during the STS-128 mission. Credit: NASA. I love that shot of the ISS. NASA ordered astronauts aboard the space shuttle Discovery to circle the Earth at least one more time Thursday after bad weather thwarted the spacecraft's first of two possible landing attempts. Discovery was slated to land just after 7 p.m. EDT (2300 GMT) at NASA's Kennedy Space Center in Florida, but unexpectedly high crosswinds and thunderstorms prevented its return. The shuttle has one more chance to land today at 8:40 p.m. EDT (0040 Sept. 11 GMT), but poor weather conditions are also expected. The space shuttle Discovery will stay aloft another day after NASA mission managers scrubbed its second and final opportunity to land Thursday, citing bad weather near Kennedy Space Center in Florida. bought at walmart last week for $13.00!!! Loved this series...couldn't believe it was this cheap. A very good deal on the DVD set, nice score. Clicky the pic below for a full size of the image. Clicky link below for the tour.